Here in the Shenandoah Valley we are so lucky to have easy access to a wide variety of healthy and nutritious local foods. From our farmers markets to our farm groceries there is no shortage of tasty snack and lunch items to be had. Please see some of the creative ideas below. We think you and your kids will be pleasantly pleased. Cheese & Wheat Cracker Lunch with Melon Cookie Cutter Shapes, Carrot Sticks and Strawberries – Served up in a tray with its own separate little compartments, this lunch can be as visually pleasing as it is delicious and fun! Most of these items from the cheese to the berries, can be found from local sources (depending on the season) at your local farm grocery or farmers market. PB & J Wrap Lunch – Spread some almond butter and your kids favorite locally made jelly or jam on a tortilla and roll or fold it. 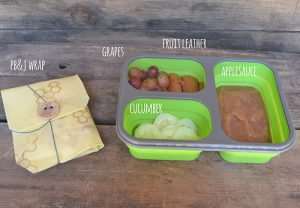 Pack with grapes, cucumber slices and locally made apple sauce. 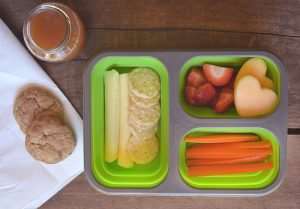 Snack Pack Style Lunch – This allows for a little variety and might tempt your little tots to try something new. 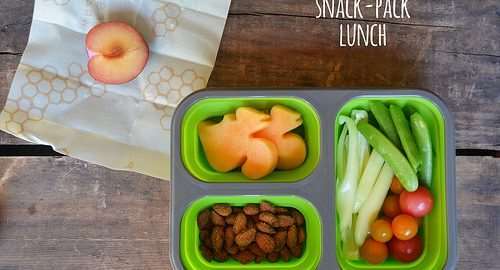 Pack nuts, their favorite fruit, bell pepper slices, cherry tomatoes and sugar snap peas, along with their favorite yogurt, half a nut butter and honey sandwich or some cheese sticks. Feel free to be creative with your options. Give them four items that they love and one item to try for the sake of being “adventure”ous! Have a great 2017-2018 school year folks!